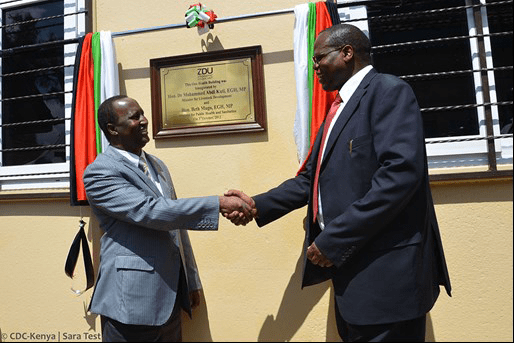 The Zoonotic Disease Unit (ZDU) is a collaboration between the animal health and human health ministries in the Government of Kenya (GoK) whose creation is part of the realization of the One Health (OH) approach in Kenya to the management of zoonoses. The One Health approach has been adopted because of the challenges the country has experienced while addressing the enormous burden of endemic zoonotic diseases, including in the areas of laboratory diagnosis, surveillance and response to outbreaks. The ZDU was created after several zoonotic outbreaks between 2006 and 2010, in response to which a special epidemic response task force was created to manage a co-ordinated response. This task force expanded to form the Zoonoses Technical Working Group (ZTWG) which later recommended the creation of a One Health (OH) office within the government. The ZooLink project whose goal is to enable Kenya to develop an effective surveillance programme for zoonoses, which is, by design, integrated across both human and animal health sectors.